The Kawanishi N1K Kyōfū (強風 "strong wind", Allied reporting name "Rex") was an Imperial Japanese Navy floatplane fighter. 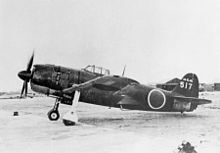 The Kawanishi N1K-J Shiden (紫電 "Violet Lightning") was an Imperial Japanese Navy Air Service land-based version of the N1K. Assigned the Allied codename "George", the N1K-J was considered by both its pilots and opponents to be one of the finest land-based fighters flown by the Japanese during World War II. The N1K possessed a heavy armament and, unusually for a Japanese fighter, could absorb considerable battle damage. The N1K-J evenly matched the F6F Hellcat and was a better match than the A6M Zero for such aircraft as the F4U Corsair and P-51 Mustang. Despite such capability, it was produced too late and in insufficient numbers to affect the outcome of the war. Airplane Picture - Kawanishi N1K1 "Rex" floatplane fighters found post-war at a Japanese Naval air base. Kawanishi's N1K was originally built as a floatplane fighter to support forward offensive operations where no airstrips were available, but by 1943 when the aircraft entered service, Japan was firmly on the defensive, and there was no more need for a fighter to fulfill this role. The requirement to carry a bulky, heavy float essentially crippled the N1K against contemporary American fighters. Kawanishi engineers, however, had proposed in late 1941 that the N1K would be the basis of a formidable land-based fighter too, and a land-based version was produced as a private venture by the company. This version flew on 27 December 1942, powered by a Nakajima NK9A Homare 11 radial engine, replacing the less powerful Mitsubishi MK4C Kasei 13 of the N1K. The aircraft retained the mid-mounted wing of the floatplane, and combined with the large propeller necessitated a long, stalky main landing gear. A unique feature was the aircraft's automatic combat flaps that adjusted automatically based on acceleration, freeing up the pilot from having to do this and reducing the chance of stalling in combat. The N1K did have a vice: If handled roughly, it could begin auto-rotation and sometimes spin out of control. The Nakajima Homare was powerful, but had been rushed into production before it was sufficiently developed, and proved troublesome. Another problem was that, due to poor heat treatment of the wheels, their failure upon landing would often result in the landing gear being simply ripped off. It was reported that more "Georges" were lost to this than to Allied forces. Apart from engine problems and the landing gear the flight test program showed that the aircraft was promising. 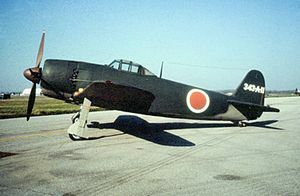 Prototypes were evaluated by the Navy, and since the aircraft was faster than the Zero and had a much longer range than the Mitsubishi J2M Raiden, it was ordered into production as the N1K1-J, the -J indicating a land-based fighter modification of the original floatplane fighter. Only four days after the Shiden's first test flight, a complete redesign was begun, the N1K2-J. The new design addressed the N1K1-J's major defects, primarily the mid-mounted wing and long landing gear. The wings were moved to a low position, which permitted the use of shorter, conventional undercarriage, the fuselage was lengthened, the tail redesigned, and the whole aircraft was made much simpler to produce, with over a third of the parts of the Shiden. Construction materials involved the use of non-critical materials. The redesign was approximately 250 kg (550 lb) lighter, faster and more reliable than the previous N1K1 version. Since there was no alternative, the Homare engine was retained, even though its reliability problems had not been fully corrected. A prototype flew on 1 January 1944 and after completing Navy trials in April, the N1K2-J was rushed into production. The variant was named the "Shiden-Kai" (紫電改), Kai standing for Modified. Airplane Picture - Kawanishi N1K2-J, probably N1K4-J Shiden Kai Model 32-only two prototypes were built. The N1K1 entered service in early 1944 and proved highly effective against American fighters. 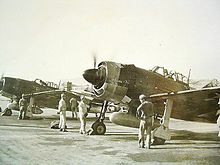 The Kawanishi were among the few Japanese fighters that could stand up to the best enemy types, including Hellcats and Corsairs. In the hands of aces, the Shiden could even outfly its American opponents. In February 1945, Lieutenant Kinsuke Muto, flying a N1K2-J, faced a dozen U.S. Navy Hellcats in the sky over Japan. He shot down four Hellcats and drove the others away. However, this account is actually a byproduct of Japan's wartime propaganda. In reality, Muto's flight of 10 engaged VF-82, shooting down four Hellcats without loss. They were, however, mechanically unreliable. The engine was difficult to maintain and, like the complicated undercarriage, plagued by frequent failures. N1K1-J aircraft were used very effectively over Formosa, the Philippines and later, Okinawa. Before production was switched to the improved N1K2-J, 1,007 aircraft were produced, including prototypes. Problems resulted in very few N1K2-J aircraft being produced, but the Shiden-Kai proved to be one of the best "dogfighters" fielded by either side. Along with high speed, the fighters were very agile with a roll rate of 82�/sec at 386 km/h (240 mph). Their weaponry comprising four 20 mm cannons in the wings was highly effective. As a bomber interceptor, the N1K2-J was less successful, hampered by a poor rate of climb and reduced engine performance at high altitude. Airplane Picture - Captured Kawanishi N1K2-Js (note US markings) having their Homare engines run up by former JNAF groundcrew. Due to production difficulties and damage caused by B-29 Superfortress raids on Japanese factories, only 415 fighters were produced. 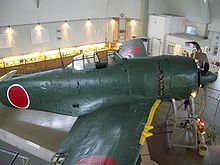 Consequently, N1K2-J fighters were mainly issued to elite units like the IJN 343rd Air Group (343 Kokutai Naval Fighter Group), commanded by Minoru Genda that was constituted on 25 December 1944. The new 343rd Kokutai consisted of the best pilots, including Kaneyoshi Muto, reputed to have single handedly shot down four Hellcats. The unit was issued the best equipment available and was also equipped with the new Nakajima C6N Saiun, codenamed "Myrt" long-range reconnaissance aircraft. On 18 March 1945, one of the "Myrts"' managed to spot U.S. carriers en route to Japan. The following morning, 343 Kokutai's Shidens intercepted 300 American aircraft. Many of the 343 Kokutai Shiden force were N1K2s. 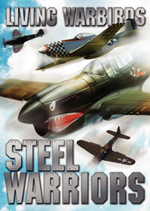 When the Shidens encountered VBF-17 Hellcats, three aircraft were lost on both sides in the initial attack; one Hellcat and two Shiden were shot down by enemy ground fire, two fighters collided in mid-air, and one Hellcat crashed while trying to land. Then the other Shiden dove on the Hellcats, downing another one. In the end, the 407 Hikotai lost six fighters versus downing eight VBF-17 Hellcats. More serious was the encounter with VBF-10 Corsairs, when two of the Corsairs were separated from the main formations, and then attacked by 343rd Shidens. Four N1K2s were shot down and the Corsairs managed to return to their carrier, USS Bunker Hill. The N1K2s soon got their revenge, when VFM-123 Corsairs were surprised by Shidens, initially mistaken for Hellcats, with a 30-minute aerial combat ensuing. Three Corsairs were shot down and another five were damaged while three other heavily damaged F4Us which had landed on carriers were subsequently thrown into the sea. Of the 10 Japanese aircraft the Americans claimed, not one was effectively downed. Two Shidens however, were shot down at landing by Hellcats of VF-9. Many other Shidens were destroyed by American fighters over another airport, where they tried to land because they were low on fuel. At the end of the day, 343� declared 52 victories, U.S. fighters 63. The actual losses were 15 Shidens and 13 pilots, a "Myrt" with its three man crew, and nine other Japanese fighters. The U.S. also had heavy losses, with 14 fighters and seven pilots, and 11 other attack aircraft. Five days later, an unofficial award was sent to 343 Kokutai for the valour shown on 19 March. On 12 April 1945 another fierce battle involved 343�, during Kikusui N.2. The Japanese scored several victories but suffered 12 losses out of 34 machines. On 4 May, another 24 Shidens were sent in Kikusui N.5. In every case, the Shiden, especially the Kai version, proved to be a capable dogfighter with the firepower, agility and rugged structure. The premier unit flying the Shiden, 343 Kokutai remained operational until the overwhelming unit losses led to the eventual retirement of the unit. The 343� was disbanded on 14 August 1945, when the Emperor ordered surrender. N1K1: only standard type as floatplane, which was used from early 1943. N1K2: reserved name for an intended model with larger engine, not built. N1K1-J Shiden ("Violet Thunder") Navy Land-Based Interceptor, Model 11: first production model: 1,484 kW (1,990 hp) Homare 21 engine with revised cover, armed with two 7.7 mm (.303 in) Type 97 machine guns and two 20 mm Type 99 cannons. Modified total-vision cockpit. N1K1-Jc,Model 11C: definitive fighter-bomber version, derived from Model 11B. Four bomb racks under wings. N1K1-J KAIa: experimental version with auxiliary rocket. One Model 11 conversion. N1K1-J KAIb: conversion for dive bombing. One 250 kg (550 lb) bomb under belly and six rockets under wings. N1K2-Ja,Model 21A: Fighter-bomber version. Four 250 kg (550 lb) bombs. Constructed by Kawanishi: 393, Mitsubishi: 9, Aichi: 1, Showa Hikoki: 1, Ohmura Navy Arsenal: 10, Hiro Navy Arsenal: 1. N1K4-J Shiden KAI 3, Model 3: Prototypes, 1,491 kW (2,000 hp) Homare 23 engine, 2 built. Total Production (all versions): 1,435 examples. At least three Shiden Kai aircraft survive in American museums. One is at the National Museum of Naval Aviation in Pensacola, Florida. The second N1K2-Ja (s/n 5312), a fighter-bomber variant equipped with wing mounts to carry bombs, is on display in the Air Power gallery at the National Museum of the United States Air Force, at Wright-Patterson Air Force Base near Dayton, Ohio. 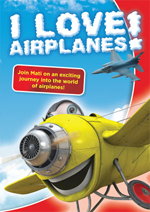 This aircraft was displayed outside for many years in a children's playground in San Diego, suffering considerable corrosion, and had become seriously deteriorated. In 1959 it was donated to the Museum through the cooperation of the San Diego Squadron of the Air Force Association. In October 2008 the aircraft was returned to display following an extensive eight year restoration. Many parts had to be reverse engineered by the Museum's restoration staff. Four different aircraft serial numbers were found on parts throughout the airframe, indicating reassembly from three different wrecks brought back to the U.S. for examination, or wartime assembly or repair from parts obtained from three different aircraft. Serial number 5312 was found in the most locations, and is the number now cited. The N1K2-Ja is painted as an aircraft in the Yokosuka Kokutai (squadron), an evaluation and test unit. The third example is owned by the National Air and Space Museum but was restored by the Champlin Fighter Museum at Falcon Field, Mesa, Arizona, in return for the right to display the aircraft at Falcon Field for 10 years after restoration. An authentic Shiden-Kai from the 343 squadron is displayed at a local museum in Shikoku, Japan. After having been damaged in battle, the pilot landed on July 24, 1945 in the waters of the Bungo Channel, but he was never found again. Six pilots from the 343 squadron disappeared that day. After recovery from the bottom of the sea during the 1970s, it was impossible to know which of the six pilots flew the aircraft. Photographs of the six pilots are displayed respectfully under the aircraft engine. One of the six lost pilots was Takashi Oshibuchi, who commanded the 701 Hikotai (equivalent to USAAF or RAF squadrons). 4x� 20 mm Type 99 Model 2 Mk 4 cannon in wings. 200 rounds per gun (up from 100 rounds per gun internally and 70 rounds per gun in underwing boots for the early N1K1-J). The 20x�101 mm round had an effective range of 1,000 m (3,280 ft) and a muzzle velocity of 700 m/s (2,297 ft/s). The 128 g shell had 6-8% HE. Rate of fire was about 500 rounds/min per gun. The guns were synchronized to converge at 200 m (656 ft). Francillon, PhD., Ren� J. Japanese Aircraft of the Pacific War. London: Putnam & Company Ltd., 1970. second edition 1979. ISBN 0-370-30251-6. Francillon, PhD., Ren� J. Kawanishi Kyofu, Shiden and Shiden Kai Variants (Aircraft in Profile 213). Windsor, Berkshire, UK: Profile Publications Ltd., 1971. Galbiati, Fabio. "Battaglia Aerea del 19 Marzo su Kure. (in Italian)." Storia Militare magazine, Albertelli edizioni, N.166, July 2007. Green, William. 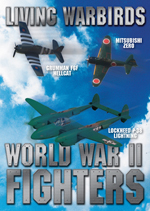 Famous Fighters of the Second World War. Garden City, NY: Doubleday & Company, 1960. Koseski, Krystian. Kawanishi N1K1/N1k2-J "Shiden/Kai" (in Polish). Warszawa, Poland: Wydawnictwo Susei, 1991. 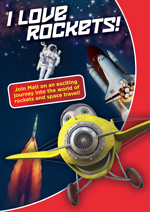 ISBN 83-900216-0-9. Sakaida, Henry. Imperial Japanese Navy Aces, 1937-45. Botley, Oxford, UK: Osprey Publishing, 1998. ISBN 1-85532-727-9. Sakaida, Henry and Koji Takaki. Genda's Blade: Japan's Squadron of Aces, 343 Kokutai. Hersham, Surrey, UK: Classic Publications, 2003. ISBN 1-903223-25-3. Werneth, Ron. "Rebirth of a Forgotten Japanese Navy Fighter." Flight Journal, Volume 13, Number 3, June 2008.